Xiaoya Gao is a fifth-year senior from Urumqui, China. In June she will be receiving a BA in History and a BM in Piano Performance. That’s right, she’s almost completed a double-degree! This industrious researcher is planning to attend graduate school after Lawrence. 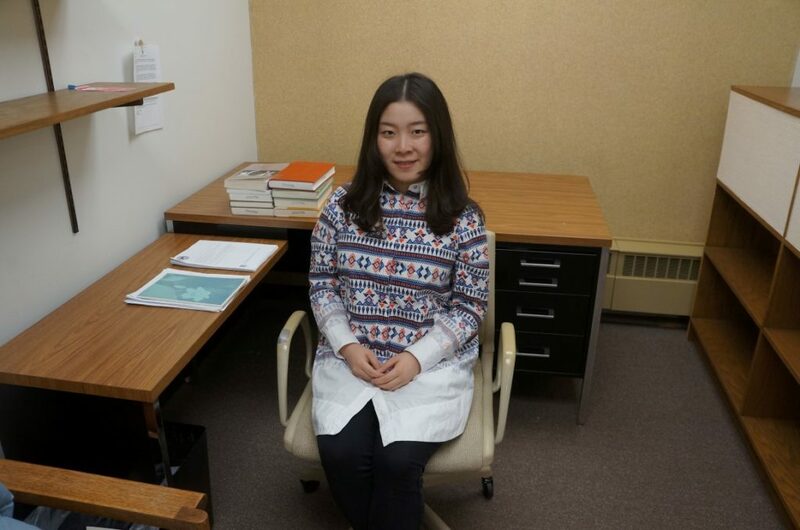 Xiaoya took some time from her busy schedule to tell us about what she’s been researching in the Mudd. Sisi, what’s the focus of your research? Female health in two late Ming novels: a path to women’s autonomy in a closed society. What are you hoping to learn or gain? I hope to learn more about the history of healing in late Imperial China by studying the novels written in late Ming and early Qing, especially the encounters between female patients and their healers. Why do you think this research is important? My research is important because female health in novels is a newly touched-upon topic in Chinese medical history. From the novels, one could see “hidden” figures and facts that were not included in official Ming documents and yet existed in the Ming society. Novels have unofficial accounts of history that the “official” history is unable to tell. In the two novels I’ve studied, the “forbidden practices” of female patients and their healers revealed that women found and wielded their autonomy through an unofficial social system. Also, half of the history of healing is missing if we ignore women’s history of healing. Female reproductive health is significant because it is a tremendous part of women’s life in the Ming dynasty. How did you become interested in this line of research? I have always enjoyed taking classes and doing research in women’s history. During my junior year, I took Chinese Women’s History and Women in Early America, and I have been in love with women’s studies ever since. After taking a class on the history of Chinese Medicine and writing a paper on a specific topic I liked, my focus on Chinese women’s medical history in novels became clear. What library materials and resources have been the most useful to you in pursuing this research? Besides the books I used from the Mudd Library, I requested many materials through interlibrary loan. I also found online resources like JSTOR and Historical Abstracts useful. Sophie is an English and history double major with a creative writing minor from Austin, Texas. She will graduate in June. After graduation, Sophie will stay in Appleton briefly, applying for graduate school and baking delicious treats at Seth’s Coffee in Little Chute. She also plans to hike the 500-mile Colorado Trail in the Rocky Mountains! Sophie will pursue her graduate degree in Library and Information Science with a concentration in archives management. She’s been a student worker for several years in the Mudd, and we know that she’s going to make a fantastic librarian and/or archivist! Read on to learn more about the research she’s been undertaking with the help of the library! Sophie, tell us about your research. I’m working on my senior capstone for history! I’m writing about the travel diary of Betty May Hale, an American 13-year-old girl who spent six months traveling in Europe with her family in 1937. Honestly, my office has been a massive help!! Especially at a small, residential school like Lawrence, it’s sometimes hard to find a space entirely to yourself that’s just dedicated to academic work. My office is a place free from distractions where I can just go and work, which has been really useful to me. Also, last term I carried all the books for my research around with me in a tote bag, so it’s great to have somewhere for them to live in the library. Other than that, the archives were a great resource, especially in the early stages of my project. What are you hoping to learn or gain from this research? I’m studying how Betty May’s travel experiences affected how she thought about herself as an American. I’m also interested in how the travel agency the family used (a company called Thomas Cook) influenced the way they interacted with Europe and the European people. The mid-late 1930’s are a really interesting time for a lot of reasons—America was just climbing out of the Great Depression, World War II was right around the corner, and the United States was in the middle of this big cultural shift from relative isolationism/neutrality to globalism. There’s a lot written about this period on a national level, but there’s not as much about individual people, especially normal Americans like Betty May. I studied abroad in London my sophomore year and had an amazing time, so I wanted to do a project that dealt with study or travel abroad to Europe. Initially I was going to compare the experiences of a few different young women traveling before World War II, and I came across Betty May’s diary in a library database called American Women’s Letters and Diaries. There was so much more material in Betty May’s diary than in any of my other sources, and eventually I just narrowed my focus to her. Sophie, thank you for taking the time to talk to us about your work! It’s been an honor and a joy to support you and we wish you all the best. Are you a current student, faculty, or staff member of Lawrence University? Are you away from campus for the summer? No worries, friends, the Mudd Library is still here for you! Whether you’re relaxing at a cottage up north, working hard at an internship across the country, or furthering your research in another country, we’re here to support you. You may not be here, but we are! Andrew explains our new ILL system at a recent staff meeting. 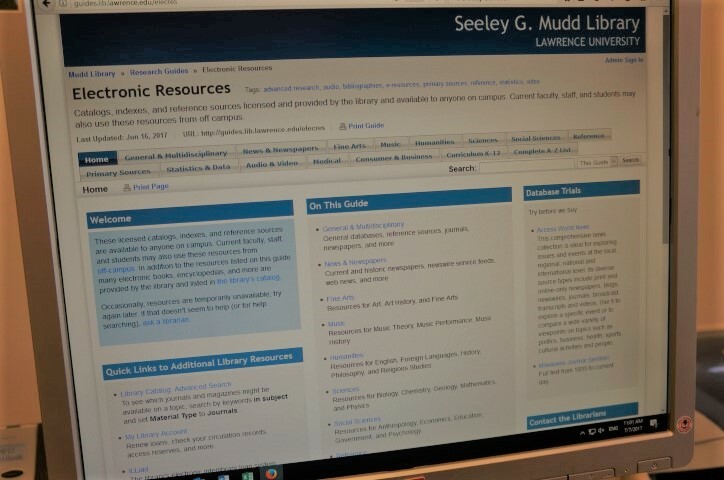 Our Electronic Resources page provides resources on a huge variety of topics: sciences, the humanities, fine arts, social sciences, medical, consumer and business, statistics, news, education, and more! Explore our electronic resources page – we have a TON of cool resources that you can take advantage of from the comfort of, well, anywhere! Watch thousands of movies and video clips from our streaming video databases. Access a bunch of newspapers and news coverage. Marvel at honors projects from 2017 or issues of The Lawrentian from 1923. You can find these in Lux, the digital home for the scholarly and creative works of the Lawrence community. Learn more about Lawrence’s history and traditions and check out the cool historical photos on the University Archives’ home page. See what folks have been up to in the Makerspace. Expand your perspective and check out our diversity and inclusion initiatives. Leave some feedback and ideas while you’re there! Take a virtual tour of the Mudd! 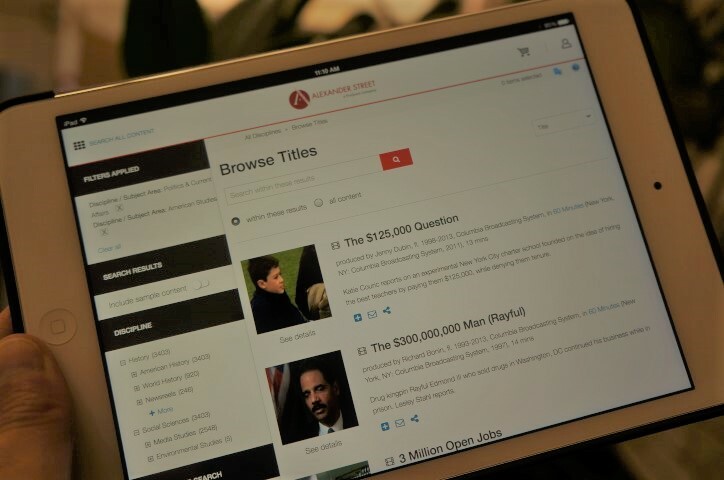 Educate yourself about critically evaluating information and sources that you find online. Request articles through Interlibrary Loan. Login to our video resources with your LU ID to access thousands of streaming videos. If you need help or have any questions, a reference librarian is on call throughout the summer, from 9 am to 4 pm, Monday through Friday. Feel free to ask a librarian if you’re having trouble accessing our resources or if you have questions about using them. No matter where you are in the world, you can still enjoy the Mudd! Upon entering Dead of Winter: New Holga Photographs I felt immediately overwhelmed by the existential loneliness that inhabited these images. The show, featuring the work Prof. John Shimon’s eleven photography students, includes an eclectic body of work yet still presents a stark and surreal picture of the winter we know too well here at Lawrence. In preparation for this show Shimon asked his students to consider the Ingmar Bergman film, Winter’s Light for both aesthetic and emotional inspiration. The film, which takes place in the isolated Swedish countryside in the middle of winter, explores the psychology of questioning one’s faith in God. The film conveys an emotional and environmental isolation that can certainly be felt in the student’s work. With few exceptions, the images are devoid of people and instead focus on the way that the cold winter landscape obscures and abstracts itself. This is perhaps seen best in the work of junior studio art major Molly Froman, who’s pair of images “Fire” and “& Ice” show a stove in a middle of a snow bank and shopping cart lying in a pool of ice respectively. Froman’s images are filled with a feeling of strange frenzy and dark humor that encapsulates the angst and beauty of Winter. The work of each student presents a sharp and distinct experience that makes for an exciting and thought provoking show. The show is closing soon so be sure to stop by the Mudd Gallery on the third floor to experience it before it closes. The Mudd Welcomes Natasha Trethewey to Lawrence! Pulitzer Prize-winning poet Natasha Trethewey will be at Lawrence November 1. The Seeley G. Mudd Library is pleased to welcome poet Natasha Trethewey to Lawrence! You can read more about Natasha and her work at the Poetry Foundation. Ms. Trethewey is also a professor at Emory University. Check out the links provided to learn more about her numerous accomplishments and honors. In addition, we’ve created a display featuring her poetry for your reading pleasure. Stop by the library to enjoy an assortment of Ms. Trethewey’s work before what is sure to be an interesting and thought-provoking convocation. Natasha Trethewey’s talk, titled “The Muse of History: On Poetry and Social Justice,” will take place on Tuesday, November 1, at 11:10 am in the Chapel. We’ll see you there! Stop by the Mudd to read some of Natasha Trethewey’s work! It’s now easier than ever to get help from the Mudd Reference Librarians with the introduction of the Ask a Librarian text and chat service. The Mudd Librarians are now available to answer all of your research questions through our online chat service or via text at 920-663-2275 during reference hours. This service makes the vast knowledge of our librarians more available to students than ever. Don’t hesitate to ask any question related to your writing and research- from the proper way to cite a source in MLA to help finding resources within the library. As always, librarians are available to answer any questions at the Reference desk or via email at reference@lawrence.edu. Additionally if you need more extensive assistance with a larger resource project you can schedule a research appointment here. Update: The reference chat and texting services will be unavailable over the summer, but will resume at the start of the school year. We’re halfway through tenth week, this term is quickly coming to a close! 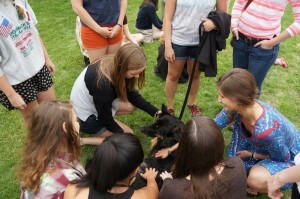 Thankfully, students can get in some puppy love during this stressful point in the term. This Monday, June 8, will be the Mudd’s annual Canine Therapy session from 10:30-11:30AM. Faculty, staff, and other Lawrence community members can bring their dogs to visit outside of the library so students can take a little bit of time to unwind and destress with the help of some friendly furry friends. Be sure to stop by! 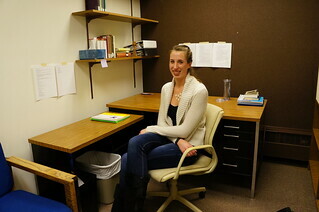 Andrea Parmentier is an Appleton native who has been working in the Mudd library for over two years. 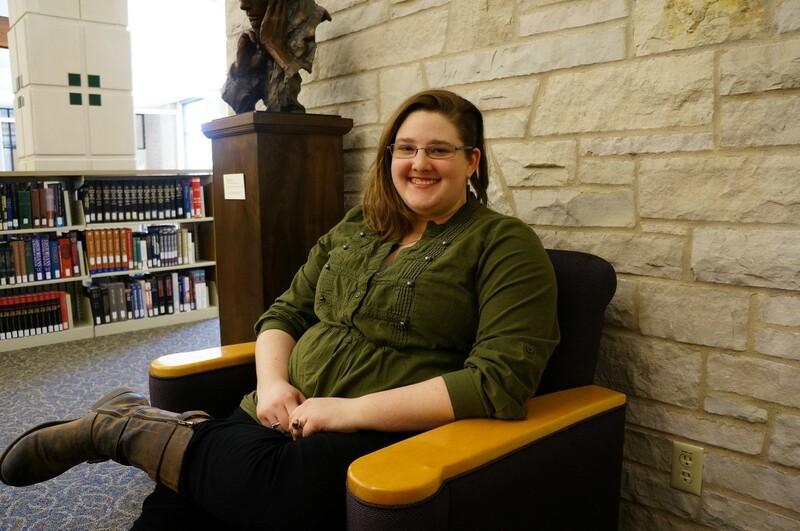 This English and Geology double major is another of our fabulous Circulation Desk Assistants, completely adept at answering questions and helping patrons find exactly what they are looking for. We appreciate Andrea’s hard work and wonderful personality. Read on to learn more about this library student worker. Andrea, what’s your favorite part of your job? Making the closing announcements is pretty fun. Share something you’ve done at work that has made you especially proud. One day an older man came in. He’s made it his mission to find a list of all WWI armed service members from Wisconsin who had died and were buried overseas, and contact family members who never found out what had happened to them or where they were buried. I helped him find the information and print it off. He was so grateful – I was very happy to have been able to help him out. As a student, where is your favorite (study/relaxation/hang-out) spot in the Mudd? I love the Milwaukee-Downer Room tables, especially the mid to late afternoon light. I write poetry, knit, bake, and have started to cultivate bonsai. What are your favorite bands or performers? It’s kind of dorky, but I’m a big fan of Flying Forms – a baroque ensemble that’s been coming to Lawrence for the past few years. How about your favorite blogs and/or magazines? Hyperbole and a Half hasn’t updated in a while, but I love it. Also, Interweave magazine. What groups and/or organizations are you active in (on or off campus)? I’m most active in the library’s knitting club and at the Fox Valley Literacy Council. When will you graduate? What are your post-graduation plans? I’m graduating this June and I’m going to grad school for a Master of Library Science. Please feel free to share anything else you’d like about yourself or the Mudd! If you knit, crochet, embroider, or do any kind of handicraft, come to the library’s knitting circle at 4:30 pm on Thursdays! We also have yarn and needles and don’t mind teaching new knitters. Thanks again to Andrew McSorley for providing this guest post, and for his excellent reporting on our Mudd March Madness event. The Mudd March Madness event pits fictional characters from all across literary history against one another. By the end of next week, a champion will be crowned, taking control of the Seeley G. Mudd Library’s bragging rights for the next year. Harry Potter and Bilbo Baggins continued their impressive dominance in this tournament, with Baggins out-dueling number one seed Darth Vader 51 – 30, and Potter once again putting up the round’s largest margin of victory with a 53 – 29 bouncing of Winnie the Pooh. “It’s really a dream come true” Potter said after cutting down the proverbial nets. “Ten points for Gryffindor! On to the Final Four! Hey, that rhymes!” Potter’s brimming smile and exuberance was matched in its intensity by Bilbo Baggins’s stoicism. “When you go up against someone like Vader you really learn a lot about yourself.” Baggins nervously shifted something over and over in his pocket as he leaned into the microphone, “I have seen dragons, the magician Potter does not frighten me.” Harry Potter has emerged as the only number one seed to advance to the final four. He is also the scoring leader for this tournament, but fans have begun to describe Bilbo as a character of “destiny.” They will go head to head in these semifinals in a fantasy bout for the ages. In both the Classics and Contemporary Fiction regions, the matches were much tighter. Sherlock Holmes and Lisbeth Salander escaped as champions of their regions, each with six point margins of victory. Lisbeth remains one of the most intriguing storylines in the tournament as many pundits believed her inexperience and tough region would keep her out of the final four. “She’s acting like she’s been here before, like she knows what’s coming next” said long-time tournament analyst Mikael Blomkvist, “I don’t know how she keeps doing it, but she finds things out about people, exploits their weaknesses. She knows how to cut someone down to size, that’s for sure.” Sherlock Holmes was not available for interviews following the news that Jack Torrance had been reported missing. Torrance was last seen wandering into a long abandoned corn maze following his first round upset loss. Holmes is investigating his disappearance. Voting for the Final Four matchups will be open through tomorrow, when the final pairing will be announced. Vote for your favorites in both of these matchups and check in soon to see who has advanced to the championship final! Do you know that the Seeley G. Mudd library has nine individual study rooms that can be assigned to students on a term-by-term basis? More information about our student offices, as well as the student office request form, can be found here. Allison Juda applied for a student office at the beginning of Winter Term to facilitate her work on her senior honors project. She is an English major and an anthropology minor from Maple Grove, MN, a Northwest suburb of Minneapolis. 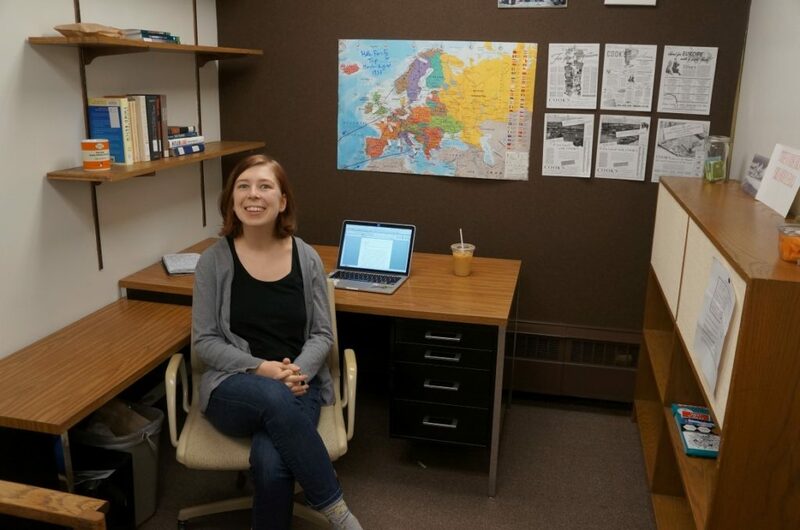 Read on to learn more about what Allison is researching in her student office in the Mudd! Allison, tell us about your research. I am currently working on a senior honors project about the portrayal of Jane Austen’s heroines and how their individual growth out of a position of liminality is reflected in many ways in societal growth so that by the end of the novels both the heroine and community are corrected and society operates once again with morality and decorum. In doing this I am combining theories of liminality produced by notable anthropologists and historical information about social structures in Austen’s time period, as well as some research on Austen herself. I noticed that all of Austen’s novels seem to follow a similar plot structure, so my main goal was to discover why Austen continued to write about the same worlds and journeys, and how that was reflective of literary, and also Austen’s contemporary, society. There has been a lot of research on Jane Austen, especially since the most recent trend of producing Austen movies (as well as other movies from her time period), but I think that not enough research has focused on the reasons why the heroines must go through their journeys. One of the most important things that I want to draw out in my work is an emphasis on the fact that these heroines are a product of their surroundings and that the growth of the social structure is instrumental in the growth of the liminal heroine. In this way, Austen’s literature is an important product of its era; in examining her literature we can learn more about her time period and social structures in general. After reading my first Austen novel, Pride and Prejudice, I was drawn into her literary work. As I entered the rabbit hole I became more fascinated with examining the works from a critical perspective and so I approached my advisor about working on the topic in greater detail. I think that the physical building itself, with great places to study is a huge asset to anyone doing research, big or small. Having a place to go to know that I am going to do work is very important in helping to keep me focused. 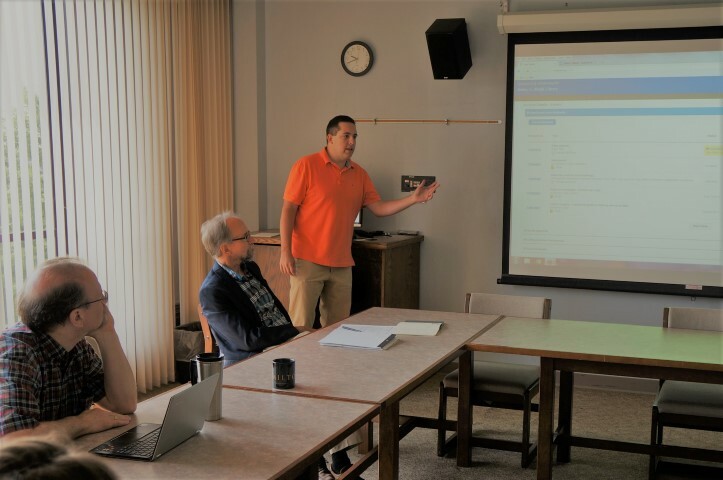 I also have taken advantage of the expertise of the reference librarians, who have helped point me in the right direction in my research, and the ILL system to get access to important works that we do not have here in Mudd. What I am perhaps most thankful for is my library office; I have two large binders with research and various drafts and well over a dozen books with which I have been working on a regular basis. Having a place to keep all of my materials safe has been a savior both on my sanity and my back (I don’t think that my poor backpack could make it without my office either). What would you like your fellow students to know about the Mudd Library? I think that something I didn’t realize my freshman year at Lawrence is that returning to the same place to study (and only study) on a daily basis really helps me get into the mindset and stay focused while I am doing my work. Studying in the library provides you with all the resources you need in the same place, from the librarians to help you if you get stumped, the scanners, printers, hole punches, staplers, and even the occasional piece of candy.